29.04.2017 - QUARTER-FINAL REVIEW: Füchse Berlin are through to the LIQUI MOLY EHF Cup Finals after another clear win against Grundfos Tatabanya KC. 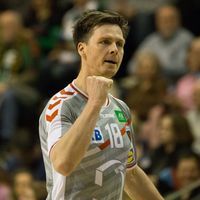 28.04.2017 - QUARTER-FINAL PREVIEW: All three return matches of the Men's EHF Cup quarter-finals are taking place in Germany on Saturday, but each under different conditions. 22.04.2017 - QUARTER-FINAL REVIEW: Füchse Berlin have come very close to the LIQUI MOLY EHF Cup Finals after a five-goal win in the first quarter-final leg against Tatabanya. 21.04.2017 - ROUND PREVIEW: Six hopeful teams play the first leg of their Men's EHF Cup quarter-final this weekend. Their aim is to join host Frisch Auf Göppingen in the LIQUI MOLY EHF Cup Finals in May.